The seeds are beginning to arrive. The garden plan is drawn. This years plant selection has been chosen for some time now. Some seeds were saved from last year, others have been purchased and are now beginning to arrive. I have been so excited it’s ridiculous. You know the kind of excited where you can’t sleep and you can’t sit still and all you can think about is (insert obsession here)? That’s how I’ve been about these seeds. Why? For me, it’s all about the possibilities. When I knit or crochet one of my favorite things is picking the patterns. It’s the same with everything I do. Recipes are beautiful, lesson plans divine, don’t get me started on fabric! 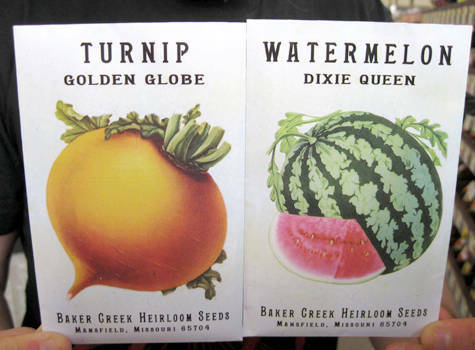 The seeds are safe in their warm dry paper packets with the brightly colored illustrations of the mature plants they are meant to become. The possibilities boggle the mind. For me it’s not just the possibility of the seedlings or even the plants, it goes far beyond these. My thoughts go to the pickles I’ll put up, the salsa I’ll create, the tabasco sauce I’ll attempt to make again this year, the soap I’ll make with the lavender oil, the pesto I’ll give as Christmas presents, Rosemary pizza dough…and so on…and so on…ad infinitum. It’s all of this and so much more!